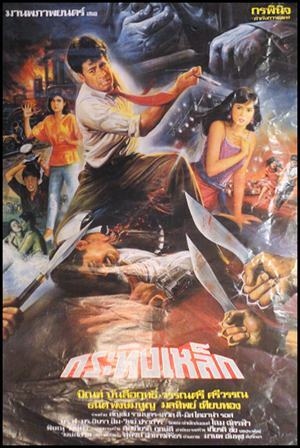 Thai movie กระทิงเหล็ก was released in year 1987 and lasts 1h26mn. Movie director is กรพินิจ. Chen (Bin Banleurit) and Prang (Tanit Pongmanoon) are roommates. Chen is working in a factory (โรงงานเหล็ก). Prang is working in a print shop. Chen meets a young lady called Pat (วรรณศรี ศรีวรรณ) in a mall but first encounter is bad. A company owner wishes his daughter Pat to replace him as he is getting old. So, he asks Panthet, GM of company, to transfer knowledge to her. Panthet, through Saen, is doing illegal business as many products sent from the factory are not written in the bank accounts (บัญชี). Pisit, involved in the illegal business, is beaten to stay quiet. Pat asks to check accounts in full details. Saen causes an accident for Pat to be injured but Chen helps her on time. The ruffians try to kill Pat again. Chen helps her ontime gain. Pisit is killed as he stole important documents he gave to Chen. Before being killed, he tells ruffians that documents are with Chen. Pisit tells Saen name to Chen before dying. That night as Chen is not at home, Prang invites his girlfriend, but ruffians storm his flat and beat him. He is finally killed despite fierce resistance. Chen beats Saen but needs to stop as he has no proof. He drinks to forget his friend's death. Panthet's girlfriend sleeps with Chen while he is drunk in order to steal the documents. Panthet finalizes a deal related to diamonds. Expensive necklace is replaced by a fake one. During a catwalk, Chen recognises one of the models wearing the necklace as Panthep's girlfriend so fighting occurs between Saen, his men and Chen. Final fighting occurs with Panthep as Chen wishes to revenge his dead friend. After successful revenge, he ends up being arrested by the Thai police.